I’m back. I am writing a long article for my blog, but I forgot to write an article for my blog Blogger Helper but now. I came back this week very crazy things going down IPL and Election. I watch IPL one word to explain wow! Match between Mumbai Indians vs. Rajasthan Royals finally, Mumbai wins a thriller wow! However, these busy days I plan to post an article for my blog a long time I post an Article for Blogger Helper sorry guys. · Use your Facebook page:Facebook page it is important to have a Facebook page and getting further likes. I have Facebook's page if you promote a blog article in Facebook's page in can increase traffic if you have more liked this method is very useful, for promote an article in Facebook's page. You must use language simple like describe your blog article simply and good language. This can attain more traffic. 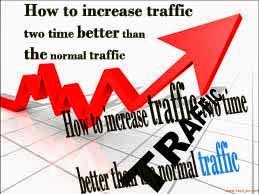 Use these above steps to increase traffic two times better than the normal traffic. If you have any problem, or you need to help conduct me, give. A Like our Facebook page Do you have Any questions comment right now!